When we were kids we didn’t have a worry in the world about cleaning up leaves. We would wait for our parents to rake them into a pile (Yes, I said rake). We would endlessly run and dive into that pile. We didn’t realize then what a pain in the a** that was for them spreading those leaves out again. Get by the cheap way at first! You still must cut the grass unfortunately it’s not done growing around here. Well, chop those leaves up. A mulching mower works best, a mulching blade for your normal mower or you can raise your mower’s blade to the highest settings. I have seen and performed all three of the above. Using a true mulching mower with a mulching blade is the best. Cut your grass like you normally would. The more leaves you have the slower you should operate the mower. This will chop those leaves into tiny pieces, you can leave the leaves directly on the ground. If you would rather a different approach, use a mower bag so that you can empty it right into your garden beds or compost pile. If you’d rather grab a rake and reminisce your childhood, make the job easier with a tarp. Does your town have pick-up times? 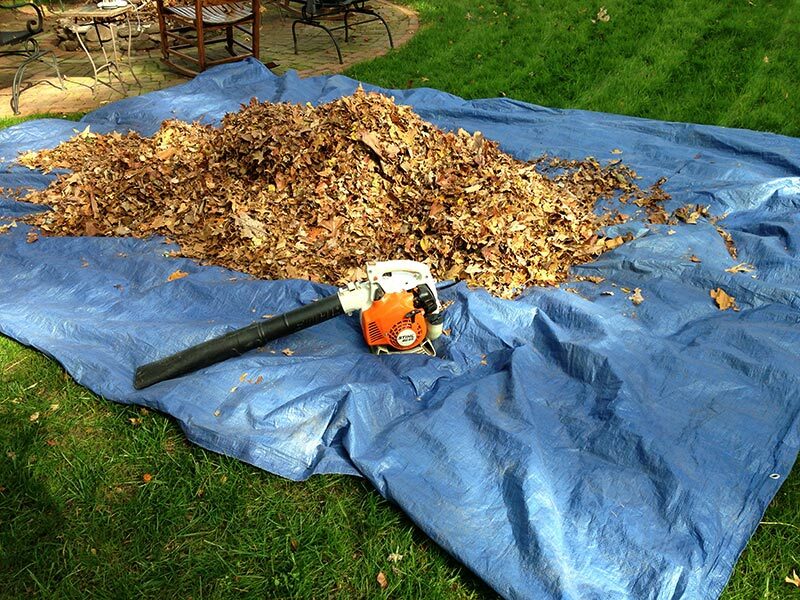 Lay a large tarp in your yard and collect the leaves on top of it. Take your leaves to the curb, just lift and dump! The tarp should not be that heavy if the leaves are dry. Or if you need to bag your leaves, use the tarp as a funnel although a smaller one would be best. Put a bag in a trash can, then have someone else guide the leaves as you hold the tarp above the can.